Access every issue of Garden Gate ever published—over 100 issues! 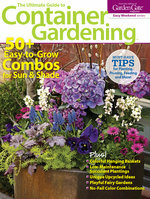 Every plant, plan, tip, and page from every issue of Garden Gate. Instant online access on your computer, laptop—even a tablet. New LOWER price for digital past issues! Already own the Garden Gate Back Issue Library USB Flash Drive or DVD? Activate your online membership now to access the entire Garden Gate Back Issue Library. Remember, it's FREE if you already own the USB Flash Drive or DVD! Access The Complete Garden Gate Library Online and also get the USB Flash Drive for only $20 more! Already own the USB Flash Drive or DVD? Garden Gate in print and online for only $29 a year (6 issues). Available in print or online!